Characteristics, History: Biblical Paintings, Vanitas Still Lifes. context of the Biblical picture.  What was the Reformation? How Did It Affect Art? What was the Reformation? How Did It Affect Art? The main characteristics of Reformation art sprang from Protestant theology which focused on the individual relationship between the worshipper and God. This emphasis was reflected in the number of common people and ordinary everyday scenes that were portrayed in Protestant art. Also Protestantism taught that the issue of salvation was reserved exclusively for God: it could not occur as a result of earthly intervention by the Vatican or any other ecclesiastical authority. Protestant art duly reflected this teaching. In addition, a number of important 'mysteries of the faith' were downplayed or ignored by Protestant theologians and artists - including The Immaculate Conception, The Annunciation of the Virgin, The Transfiguration of Christ, to name but three. Transubstantiation (the transformation of the Communion bread and wine into the body and blood of Christ) was another key area of disagreement between Luther and Rome. Roman Catholicism believed in a strict interpretation of this doctrine, and therefore tended to use Crucifixion scenes for their altarpieces, while Protestant Churches - at least those who tolerated figure painting - insisted on a symbolic meaning behind the Eucharist, and so preferred scenes of the Last Supper. In general, as far as other Biblical themes were concerned, Protestant art tended to avoid: grandiose images of Jesus or the Virgin Mary; big set-piece scenes from the Bible (like the Passion of Christ); images of the Saints; and, in particular, depictions of the Popes and other senior clergy. Instead, Protestant art focused on humble depictions of biblical scenes and moralistic depictions of contemporary everyday life. See also the architectural paintings of Emanuel de Witte (1615-1692) and Pieter Jansz Saenredam (1597-1665), famous for their whitewashed church interiors. Not all Protestants had identical views on what Church art was acceptable: Lutherans, for instance, tended to be more tolerant than Calvinists, who banned all figurative altarpiece art and considered most religious images to be idolatrous. Some forms of art, however, were seen as more in keeping with a modest, personal approach to religion: they included book illustration and various forms of printmaking, such as engraving and etching (centered on Antwerp), all of which were used by Protestant authorities to convey their religious ideas to their congregations, and religious education into the homes of the common people. In particular, these small-scale types of art permitted the development of a specifically Protestant iconography, which included Protestant-style images of Christ, the Holy Family, Saints and Apostles, as well as illustrations of all the people and events in the Bible. In simple terms, Protestants removed public art from their churches and urban spaces, preferring instead to champion their faith via small-scale, humble Biblical images in various printed formats, including illustrated bibles. At the same time, Protestant societies embraced a low-key style of art which promoted the need for personal piety as well as a respect for the unvarnished beauty of God's creations, including people created in His image. In contast, the Catholic Counter-Reformation fully supported inspirational or educational church art - see, for instance, the glorious fresco paintings and other quadratura works in Rome - and continued to champion its own brand of "sacred art", which illustrated important issues of Catholic dogma, or celebrated Catholic traditions, notably the liturgy, the sacraments and the saints. Although the reaction of churchmen, congregations and secular leaders varied considerably from country to country, and from region to region, in general, the Protestant Reformation triggered a wave of iconoclastic destruction of Christian imagery. Several Protestant leaders, notably John Calvin and Huldrych Zwingli, ordered that churches be stripped of their pictures and statues. If a painting (like a mural) could not be removed it was whitewashed over; where sculpture was part of the architectural fabric of the building (either a column statue or a relief sculpture), it was defaced or smashed, as were countless examples of beautiful stained glass art. Secondary altars were dismantled or physically removed. All reliquaries (containers of relics), gold altar furnishings, and ciboria (containers of items used in the Eucharist) were melted down, while large bonfires were used to burn paintings, sculptures, ecclesastical fixtures and other objects, including: triptychs and larger polyptychs, other panel-paintings, most examples of wood carving, including statues, carved choir stalls and confessionals, missals and other illuminated manuscripts, and vestments. This iconoclasm was intensified during the so-called "Second Reformation" of about 1560-1619. There were comparatively few instances of churches actually being destroyed. To deprive them of their "Catholic" identity, all that was needed was to remove their "Catholic" decorations, and insert a pulpit in a prominent position. New churches were designed more as auditoriums focused more on the pulpit and less on the altar. Ornamentation was generally kept to a minimum, although some architects - such as Christopher Wren (1632-1723) - were more High Church than others. Paradoxically, the removal of "Catholic" architecture and its replacement with less imposing Protestant designs, may have been a factor in the spread of pagan Neoclassical architecture two centuries later. Political leaders in Protestant countries proved highly supportive of the Reformation, not least because it enabled them to take over the lands and wealth of the Roman Catholic Church and its monastic orders. For example, when the shrine of S. Thomas Becket in Canterbury Cathedral was dismantled, it yielded 24 cartloads of treasure, including numerous exquisite items of medieval goldsmithing, which was promptly melted down for Henry VIII's treasury. The Reformation also gave secular rulers far greater control over the appointment of bishops and other clergy. Following considerable turmoil, a degree of reconciliation of Catholics and Protestants was achieved in 1555 with the Religious Peace of Augsburg, which granted freedom of worship to Protestants. This compromise did not apply to art, however, and both painting and sculpture, as well as architecture, continued to be used as propaganda by the two rival Churches. Both the German Renaissance and the Netherlandish Renaissance were coming to an end by the time the Reformation gathered momentum. In Germany, most of the leading artists like Martin Schongauer (c.1440-91), Matthias Grunewald (1470-1528), Albrecht Durer (1471-1528), Albrecht Altdorfer (1480-1538), Hans Baldung Grien (1484-1545) and others, were either deceased or in their final years. The same could be said of the situation in Holland - whose greatest master - Hieronymus Bosch (1450-1516) - had just died, and of 16th-century Flemish Painting, whose stars included Quentin Massys (1465-1530), Jan Provost (1465-1529), Jan Gossaert (1478-1532), Joachim Patenier (1480-1525), and Joos van Cleve (1490-1540). Born in Augsburg, Germany, where he trained under his father Holbein the Elder, Hans Holbein the Younger (1497-1543) was active in Lutheran Basel but mostly in London, where he painted Henry VIII and Thomas Cromwell, both of whom were busy establishing the English Reformation and organizing the Dissolution of the Monasteries. His masterpieces include: Portrait of Erasmus (1523, National Gallery, London); Portrait of Sir Thomas More (1527, Frick Collection); Portrait of a Lady with a Squirrel and a Starling (1528, National Gallery, London); The Merchant Georg Gisze (1532, Gemaldegalerie, SMPK, Berlin); Portrait of Thomas Cromwell (1532-4, National Portrait Gallery, London); The Ambassadors (1533, National Gallery, London) and Portrait of Henry VIII (1536, Thyssen-Bornemisza Museum, Madrid). Only the great Flemish painter Pieter Bruegel the Elder (c.1525-1569) was around to put his stamp on Protestant-style painting in the Low Countries, with a series of great genre paintings (including tavern scenes), and to pass on his skills to pupils like Frans Snyders (1579-1657). 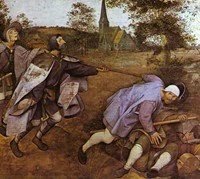 Bruegel's best genre works include: Netherlandish Proverbs (1559, Gemaldegalerie, SMPK, Berlin); Hunters in the Snow (1565, Kunsthistorisches Museum, Vienna); and Peasant Wedding Feast (1568, KM, Vienna). His best religious works - all set in commonplace landscapes or situations include: Tower of Babel (1563, KM, Vienna); Massacre of the Innocents (1565-67, KM, Vienna); and Parable of the Blind (1568, Capodimonte Museum, Naples). In fact, Flanders was (mostly) a Roman Catholic country, which was dominated by a small number of affluent (if declining) commercial centres including Antwerp, Bruges, Ghent, and Ypres. During the mid-16th century, a Protestant lawyer fled Antwerp for Germany, in order to escape religious persecution. In Germany, he fathered a son who duly returned to Antwerp to become the greatest ever exponent of Catholic Counter-Reformation art - his name was Peter Paul Rubens (1577-1640). Dutch Baroque art of the 17th century exemplified the new forms of Protestant painting. It illustrated the down-to-earth, everyday context for Biblical subjects, required by the Protestant authorities; it gave birth to many of the best genre painters of the 17th century - whose works offered clear moral guidance on how to live a pious life - and to several of the best still-life painters we have ever seen. This is exemplified by the work of Rembrandt (1606-69), whose religious paintings always emphasized the human individuals involved, rather than any grandiose doctrinal issues. Examples include: Bathsheba Holding King David's Letter (1654, Louvre, Paris); The Jewish Bride (c.1665-8, Rijksmuseum, Amsterdam); and Return of the Prodigal Son (1666-69, Hermitage Museum). Dutch Realist Genre Painting - mostly small-scale oil paintings of everyday scenes, containing a covert Christian or moral message - involved some of Holland's greatest Old Masters. Tavern scene painters included Adriaen Brouwer (1605-38), Adriaen van Ostade (1610-85) and Jan Steen (1626-79); domestic scene painters included Gerrit van Honthorst (1592-1656), David Teniers the Younger (1610-90), Gerard Terborch (1617-81), Gabriel Metsu (1629-67) and Pieter de Hooch (1629-83). See, for instance, moralistic pictures like The Concert (1625, Borghese Gallery, Rome) by Gerrit van Honthorst, Couple Flirting Outdoors (c.1650, Stedelijk Museum, Leiden) by Jan Steen, and Mother Lacing Her Bodice Beside a Cradle (1662, SMPK, Berlin) by Pieter de Hooch. 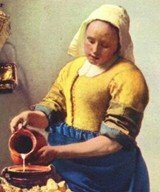 The greatest genre-painter however was the Delft painter Jan Vermeer (1632-1675), whose masterpieces include: The Little Street (1657-58, Rijksmuseum, Amsterdam); The Milkmaid (1658-60, Rijksmuseum); Woman Holding a Balance (1662-63, National Gallery, Washington DC); Young Woman with a Water Jug (1662, Metropolitan Museum of Art, NY); Woman with a Pearl Necklace (1663, Gemaldegalerie, SMPK, Berlin); and The Lacemaker (1669-70, Louvre, Paris). Protestant still lifes were basically symbolic pictures, containing a covert religious narrative. A particular example is the "Vanitas still life painting" - derived from Ecclesiastes 12:8 "Vanity of vanities saith the preacher, all is vanity" - which typically contains symbolic images (including skulls, snuffed candles, hourglasses with the sand running out, watches, butterflies etc.,) to remind the observer of the transience of mortal life, compared to the permanence of true Christian values. Specialist still life artists included: Frans Snyders (1579-1657), who is noted for still lifes of dead game and meat, crammed with religious allusions and moral pointers; Harmen van Steenwyck (1612-56), the leading vanitas painter; Willem Claesz Heda (1594-1681), an exponent of monochrome banketje; Pieter Claesz (1597-1660), a specialist in ontbijtjes (breakfast still lifes); Jan Davidsz de Heem (1606-83) and Willem Kalf (1619-93), who specialized in decorative still lifes; Samuel Van Hoogstraten (1627-78), whose speciality was interiors with deep linear perspective; and Rachel Ruysch (1664-1750), arguably the greatest ever female flower painter. Among the greatest Protestant still-lifes are: The Vanities of Human Life (1645) by Harmen Steenwyck; A Vanitas Still Life (1645) by Pieter Claesz; Breakfast of Crab (1648, Hermitage, St Petersburg) by Willem Claesz Heda; Still Life with Chinese Porcelain Jar (1662, SMPK, Berlin) by Willem Kalf; The Slippers (1654) by Samuel Hoogstraten; Decorative Still Life in front of Architecture (A Dessert) (1640, Louvre, Paris) by Jan Davidsz de Heem. Protestant Reformation art can be seen in some of the best art museums around the world.  For more about Catholic and Protestant paintings, see: Homepage.